Murania Press » Murania On The March Once More! I can hardly believe it’s been more than six weeks since I last updated this blog. Hurricane Sandy, which was just about to strike New Jersey when last I posted here, spared my immediate neighborhood but wreaked havoc nearby; we were dealing with power outages, blocked roads, and long lines at gas stations for weeks afterward. Having just moved, I was still trying to organize things in my new home when the storm hit. That process took longer than anticipated due to periodic blackouts that afflicted the area as power-company repair crews shut down the grid for many hours at a time. I did manage, however, to keep working on the Murania Press publications announced for November and December release, and while I’m running a little late, you can still count on seeing some of the new product by year’s end. Blood ‘n’ Thunder’s Fall 2012 issue (#35) is in layout as I write these words and will go to press shortly. It features a double-pronged tribute to Tarzan, the immortal ape man created by Edgar Rice Burroughs one hundred years ago. Pulp-art historian David Saunders contributes a career overview of Stockton Mulford, the talented illustrator who painted several Argosy All-Story covers touting ERB stories. Mulford also had a, shall we say, special connection to another Burroughs illustrator, and David spells it out in considerable detail (including original illustrations to boot). Part two of the Tarzan centennial tribute is my installment of “Cliffhanger Classics” covering the 1933 serial Tarzan the Fearless, long considered lost except for an 85-minute feature version edited in England and imported here decades ago for TV syndication. My research uncovered many heretofore undisclosed facts about this chapter play, and the article also features the recollections of Tarzan the Fearless star Buster Crabbe, with whom I spoke several times during the 1970s. Buster Crabbe and Jacqueline Wells in TARZAN THE FEARLESS (1933). The other department installments are equally noteworthy, I think. “Pulp Page to Silver Screen” explores the similarities—or lack thereof—between A. Merritt’s 1932 novel Burn, Witch, Burn! and its 1936 film version, The Devil-Doll, directed by horror-movie specialist Tod Browning. “Tricks of the Trade” reprints a 1939 Writer’s Digest article by Fawcett editor Ralph Daigh, reporting on pulp writers who migrated to true-crime magazines when their old markets began drying up. And “Adventurous Airwaves” finds regular BnT contributor Martin Grams Jr. giving a brief history of the 1935 Phillips H. Lord radio series G-Men, which was the predecessor of his even more successful Gang Busters. Nathan Madison, who contributed a lengthy article on Argosy founder Frank A. Munsey in a previous issue of BnT, attended his first pulp-fan convention earlier this year and accepted my invitation to write a con report. But he went beyond the simple who/what/when/where account I expected, in the process raising some important questions about the future of the pulp-collecting hobby. Therefore, instead of severely editing his piece to make it an installment of BnT ’s “Convention Corner” department, I decided to run it complete as a feature article. You’ll find it very interesting, even if you’re not a regular attendee of such confabs as the annual PulpFest and Windy City shows. The issue’s longest piece—nearly 10,000 words—documents the working relationship between Wild West Weekly editor Ronald Oliphant and his star writer, Paul S. Powers, who published his WWW yarns under several Street & Smith house names and created many of the magazine’s most popular recurring characters: Sonny Tabor, Kid Wolf, King Kolt, Freckles Malone, and Johnny Forty-Five. This article relies heavily on Oliphant’s letters to Powers (who saved practically all of his correspondence with the editor) and therefore offers an inside look at the process of editing and publishing a successful weekly pulp magazine. 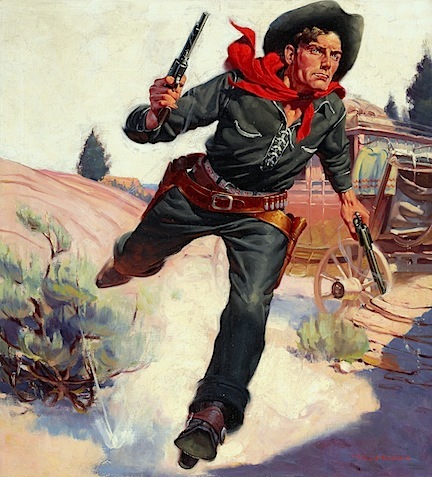 Bob Harris painted this 1935 WILD WEST WEEKLY cover. Additionally, the new BnT includes our longest letter column to date. This time around, “Epistolary Exchange” is dominated by reader response to the previous issue’s look at the New Pulp movement. I received more comments on this piece than on any other article I’ve ever printed in BnT, and they were almost uniformly negative. Do these letters reflect your own opinion? I’ll be curious to know. The latest BnT boasts nearly a hundred illustrations, including numerous pulp paintings scanned from the original art. Watch this site’s home page for the announcement that copies are ready for shipping. If you aren’t currently subscribing, why not take advantage of our Shopping Cart option and sign up today? A couple mouse clicks and you’ll be good to go. I’ve been looking forward to reading the WILD WEST WEEKLY article ever since Laurie Powers mentioned the correspondence to me a few years ago. Sounds like another excellent issue. Looking forward to the Wild West Weekly article.The correspondence between the writer and the editor should be good.